Upon further inspection, I’ve discovered that the entire album featuring the single “Dog Police” — which, you’ll remember, is called Dog Police, and is performed by the band Dog Police — is available for purchase from Amazon. I can’t quite make myself commit to a purchase, but the samples Amazon provides are nothing short of incredible. It’s like Mark E. Smith kidnapped Thomas Dolby and forced him to make music for robots. I’m mainly posting this to confirm my own sanity, since nobody seems to have any record of the Dog Police TV pilot existing, and all of these songs could very well be the product of my own imagination. Surely someone else can hear them too? Anyway, I promise to make this my last Dog Police-related post unless there is a significant new development. Maybe I should get the Fish Police on the case. Or Poochinski. This entry was posted on Friday, June 25th, 2010 at 1:05 pm and is filed under Potpourri. You can follow any responses to this entry through the RSS 2.0 feed. You can leave a response, or trackback from your own site. The failed pilot that I am sure existed but I can’t find any evidence of was one that I think ABC did, about a computer-generated, motion-captured sheep who worked in an office. It was a terrible pilot (even at age 11 or whatever I recognized this) but Dog Police got me thinking about it and it seems to have not left any traces. Amazon lists the copyright holders as Sam Shoup ( http://samshoup.com/Pages/Bio.html ), Tom Lonardo ( http://tomlonardo.com/bio.html — “He is the captain of DOG POLICE!”), and Anthony Thomas ( http://tonythomastrio.com/news.html — note the names! The band clearly still plays together). Of the three of them, Sam seems proudest of his Dog Police days; he links to two Dog Police videos — one of them, of course, being Dog Police, but the other being a tune about home shopping called 1-800 ( http://www.youtube.com/watch?v=aiy89VP_bF4 ). 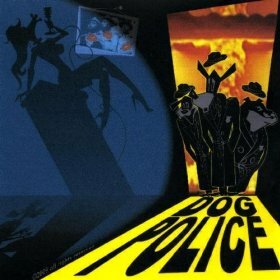 The Dog Police album available on Amazon is also sold by CDBaby ( http://www.cdbaby.com/cd/dogpolice ), which says it’s a 2009 remaster and re-release of the original, with three extra tracks. Sam Shoup has a picture of the original cover on his website. So, yes, the Dog Police were real, and not only that, they were and continue to be professional musicians. You’re not hallucinating.